Earlier this week my six-year-old grandson Luke said, “Grandma, I have an infected finger.” Then he turned one hand palm up to show me. Sure enough, the joint area of his middle finger was puffy and purplish. Luke—my grandson with a high tolerance for pain—figured he could handle his owie on his own, but he discovered otherwise. The moment his mom discovered the wound, she cleansed it thoroughly, applied antibiotic ointment, and wrapped his finger in a bandaid. That’s when healing began. Everybody has their own problems. They don’t care about mine. Other people’s problems are more significant than ours. Ours are trivial in comparison, so why should we even talk about them? We ought to be able to figure this out on our own. The nature of my heart-hurt makes me feel like a failure as a mother, a wife, a Christian. If I tell others about what’s happened, they might think I’m a failure, too. My hurts are no one else’s business. I’ll keep my pain private. “Dear brothers and sisters, if another believer is overcome by some sin, you who are godly should gently and humbly help that person back onto the right path. And be careful not to fall into the same temptation yourself. 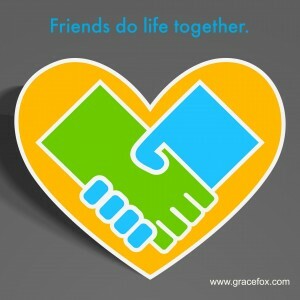 Share each other’s burdens, and in this way obey the law of Christ” (Galatians 6:1,2 NLT). The enemy of our souls loves to lie: “You shouldn’t tell anyone about your pain. No one really cares, anyway. What will they think of you if they knew your secret?” He knows that keeping us in isolation paves the way to discouragement and defeat. But don’t let him deceive you! Disclosing our struggles to a trusted godly friend can help ease the burden we carry. Praying with someone and knowing that she’s continuing to pray for us brings strength. Knowing we’re not alone brings the encouragement needed to persevere. That said, how might I pray for you today? Thanks, Grace, for sharing your thoughts today. It was just what I needed. Thank you for offering to pray for the needs of others. I have one that I would like to share and ask for prayer. 1) the sale of our mobile home – especially that it will sell to the right individual or family during these summer months. We have had several “bites”, but nothing definite. In the meantime, while we wait, that the Lord will provide the finances to care for utilities each month. God is able…may we hang onto that! !